Outside of its native Japan, sumo wrestling is seen as something of a punch line—fat men in diapers colliding for the amusement of the crowd. However, it is a sport steeped in tradition, requiring enormous skill and dedication. The world of sumo rikishi (wrestlers) is full of fascinating facts, from their ravenous appetites to dark affiliations with the Japanese mob. 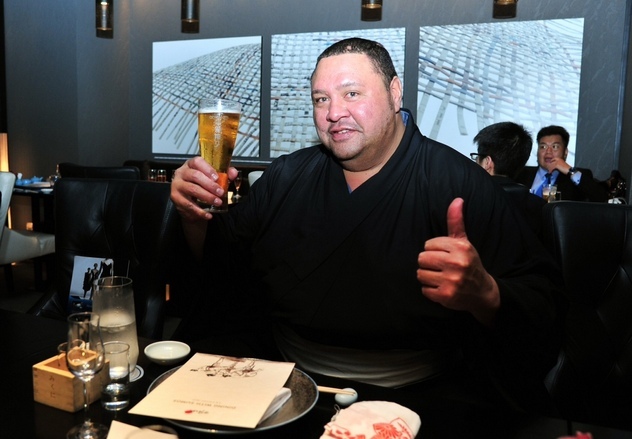 The term yokozuna denotes the highest rank in sumo. Like the colored belts in other martial arts, there are no set requirements to become a yokozuna. Rather, it is a state of athleticism and grace. For years, foreigners (or gaijin) were prevented from attaining this rank, including mega-popular wrestler Konishiki, who was born in Hawaii. Konishiki was the heaviest recorded sumo wrestler in history, carrying 287 kilograms (633 lb) on a 184 centimeter (6’1/2″) frame. However, in 1993, another massive Hawaiian-born competitor would finally become the first non-Japanese yokozuna. Chad Rowan (pictured above), who wrestled under the name “Akebono,” stood 203 centimeters (6’8″) and weighed over 227 kilograms (500 lb). Although they make up a small percentage of the total number of wrestlers, today gaijin dominate sumo, so much so that there hasn’t been a Japanese yokozuna in over a decade. The vast majority of victories are taken by Mongolian and Eastern European wrestlers, who utilize different styles and tend to overpower Japanese competitors with sheer brute force. The three currently active yokozunas all hail from Mongolia. As sports go, Canada is far better known for ice hockey than for anything else—and certainly not for sumo wrestling. However, the Great White North was home to one storied rikishi named John Tenta. Hailing from British Columbia, Tenta attended Louisiana State University, where he participated in a variety of sports including wrestling, football, and rugby. After meeting a sumo wrestler traveling in Canada, Tenta was recruited to travel to Japan and take up the sport. He was quite successful, wrestling under the name “Kototenta” (literally “Tenta the Harp”). However, the rigors of the sumo lifestyle did not behoove Tenta. Moreover, to continue his career, he would have been forced to endure painful skin graft surgery to remove a large tiger tattoo (the mascot of his alma mater) he had on his arm. Tenta resigned from sumo but landed on his feet as a professional wrestler, eventually ending up in the WWF, where he performed under the name “Earthquake,” a villainous character who skirmished with the likes of Hulk Hogan. To provide an illustration of Earthquakes’s immensity, the above clip shows him assaulting—and not looking that small beside—Andre the Giant. Sadly, John Tenta succumbed to bladder cancer in 2006, aged just 42. Anyone who has ever witnessed a marathon can attest that the first people across the finish line have a similar build—tall and willowy, with knotty muscles that allow them a tremendous endurance. Traveling 42 kilometers (26 mi) is quite a feat for an average person, never mind a sumo wrestler. But in 2011, a 180-kilogram (396 lb) rikishi named Kelly Gneiting did the impossible—he completed the LA Marathon. It was no easy task—Gneiting was able to jog the first 13 kilometers (8 mi), but then he had to walk. He took so long to finish—9 hours, 48 minutes, and 52 seconds— that the streets had reopened before he was through, and he was forced to walk on the sidewalk and wait for crossing signals. Gneiting claimed he was “delirious” after the first 16 kilometers (10 mi), but he soldiered on despite harsh weather. The home stretch was brutal. 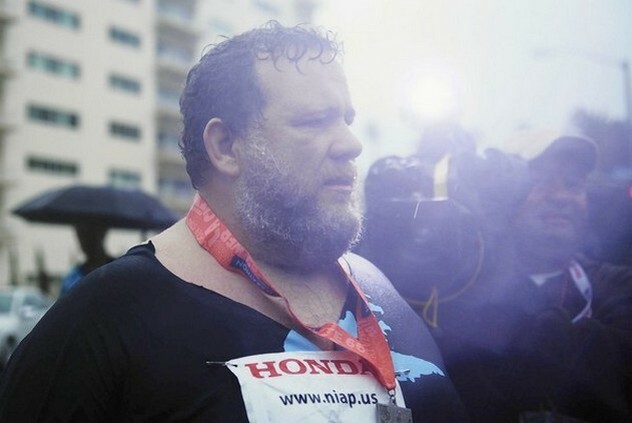 Gneiting claimed, “I was really struggling in the last five miles, but I said to myself, ‘If I have to crawl, I will.’ ” For his accomplishment, Gneiting set the Guinness World Record as the heaviest man to complete a marathon, which had formerly belonged to a man weighing 125 kilograms (275 lb). From football to soccer to basketball, referees are without fail the most despised people on the playing field. Their enforcement of the rules is crucial to any game’s outcome. One bad call can change everything. Fortunately, instant replays have largely mitigated the effect of bad calls in most sports. However, even the worst judgment rarely has any consequence except the vitriol of fans. But in sumo, referees (called gyoji) consider their calls a point of honor—to the extent that they carry knives on them as a symbol of their intent to commit seppuku in the instance of a mistake. Of course, no one actually commits suicide, but in the instance of a bad call, referees traditionally tender their resignations to the organization they work for. The duties of a gyoji can also sometimes be dangerous. As a rule, these men tend to be small, to offer a stark contrast between themselves and the hulking wrestlers. In one scary incident in January 2012, seen in the above video, referee Shozaburo Kimura was forced from the ring and knocked unconscious. From Atkins to South Beach, most diets are focused on helping people lose weight. However, sumo wrestlers are instead determined to pack on the pounds. Unlike most other combat sports, sumo does not separate its contestants into weight classes, so the larger the competitor is, the better his advantage in pushing around smaller guys. Allowing wrestlers to gain the most weight possible is carefully plotted. Rikishi wake at dawn and begin training without having breakfast on the assumption that this slows down the metabolism and makes it more difficult to burn calories. Around lunchtime, the wrestlers sit down to a protein-rich stew of meat, vegetables, and rice called chankonabe, along with multiple side dishes. This feasting can be quite an ordeal, as the men eat to the point of nausea. This massive repast is followed by a nice long nap, where the calories are allowed to take root. Around dinnertime, the giants awaken from their slumber to take part in yet another huge meal before retiring for the night. In the last few years, sumo has declined steeply in popularity. Younger people are more interested in baseball, soccer, or even golf, and the audiences at matches tend to be comprised largely of senior citizens. However, there is one rather unexpected group that has been drawn toward sumo—the yakuza, or Japanese mafia. The yakuza has been linked to extortion against the wrestlers, particularly those who enjoy sports betting, which is against the law in Japan. In 2010, popular wrestler Kotomitsuki was dismissed from the sport after admitting to betting on baseball games. Rikishi have also been accused of match fixing in their own sport. There have been rumors of cheating in sumo for years; it was a key subject in the 2005 book Freakonomics, which exposed some ugly statistics that all but guaranteed the sport was rife with corruption. This is mostly tied to collusion—wrestlers doing each other favors. For instance, if a wrestler with a 7-7 record was facing a wrestler with an 8-6 record, the 8-6 competitor might take a fall, leaving them both with winning records intact. The 7-7 wrestler would later owe a favor and would be far likelier to take a fall in a rematch. In 2011, wrestlers finally admitted to fixing matches, arranging payouts behind the scenes, and choreographing the bouts much like “professional” wrestling, where moves are planned in advance. That year, the Japan Sumo Association canceled March’s grand tournament, the first such cancellation since 1946. Not all sumo wrestlers are mountainous; some rely on speed and agility rather than sheer girth. Case in point: Pavel Bojar—a wrestler from the Czech Republic (where sumo is inexplicably popular)—who competed under the name “Takanoyama.” Unlike his peers, Takanoyama was unable to really pack on the pounds, carrying just 98 kilograms (216 lb) on a 185-centimeter (6’1″) frame. So desperate was Takanoyama to gain weight that he was caught using insulin in 2011, for which he received a warning. His weight was a grievous disadvantage that Takanoyama tended to overcome using throws, which used his opponents’ weight and momentum against them. He used a variety of different throws to attain victory, including the uwatenage (overarm throw), shitatenage (underarm throw), and kakenage (hooking inner thigh throw). Despite his comparatively slight build, Takanoyama rose quickly up the ranks, making it into the makuuchi division—the top tier of professional sumo. He largely faltered against the sport’s most elite athletes and was demoted and promoted again several times before finally retiring in 2014. Given their physique, it might seem natural to assume that sumo wrestlers are couch potatoes. This could not be further from the truth. Their lives are as harshly regimented as those of prison inmates. The training has been described as “torturous,” hours of flinging one’s body against unyielding targets and strength training. Moreover, the sumo lifestyle is no sure route to fame and fortune—there is little profit to be had as a rikishi; wrestlers don’t even begin earning a salary until they make it into the upper ranks. Until then, they train and essentially act as servants for other members of the stable. Living as a sumo wrestler is less a profession than a lifestyle—and an archaic one at that. Wrestlers must dress in a traditional fashion and are even prohibited from driving. And while rikishi are doubtlessly the healthiest fat guys around, carrying that much weight is certainly detrimental to a person’s health. Sumo wrestlers generally die 10 years earlier than the average man. Their health problems are manifold, including joint issues, kidney and liver troubles, and hormonal imbalances, among others. Hazing in sports is nothing new. It can range from mild and good-natured to outright sinister. In 2014, horrifying news broke from Sayreville War Memorial High School in New Jersey, where freshman football players were allegedly sexually abused by upperclassmen. Sumo has also been touched by some ugly scandals. A bit of hazing in the stables is traditional; the younger, lower-rank wrestlers act as servants for their elders, doing the cooking and cleaning. There are even (possibly apocryphal) tales of young rikishi being forced to wipe the butts of high-ranking men too plump to reach into the deepest crevasses of the body. In June 2007, a horrifying scandal rocked the world of sumo when a man died during training at the Tokitsukaze stable. The wrestler, 17-year-old Takashi Saito, was originally described as having succumbed to cardiac arrest, but an autopsy indicated that he’d been savagely beaten. 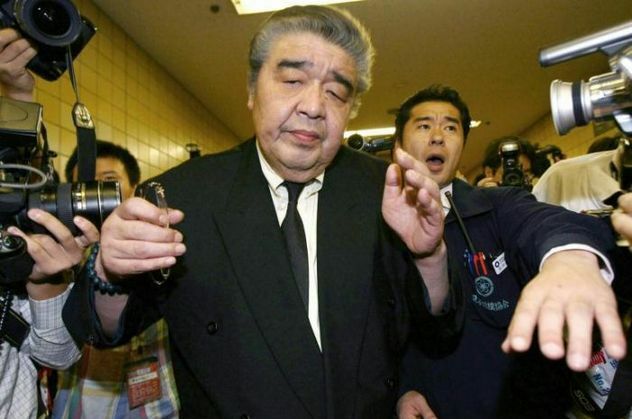 Saito had not taken to the sumo lifestyle and had attempted to escape the stable several times. At the instruction of stable master Junichi Yamamoto (pictured above), Saito was bound to a pole and beaten by three other wrestlers with a beer bottle and a baseball bat as punishment for his “vague attitude.” This attack allegedly left his jaw dangling from his skull. Yamamoto initially tried to hide his culpability by suggesting that Saito be cremated, thus destroying any evidence of what had occurred. However, the boy’s father called for an investigation. The stable master was eventually sentenced to six years in prison. The three men who beat Saito were given suspended sentences, as they had acted on orders. Yamamoto died of lung cancer on August 12, 2014. The vast majority of professional sports are dominated by men. Even in sports with female divisions, women aren’t taken nearly as seriously. For example, LA Lakers star Kobe Bryant makes nearly three times the salary of the entire roster of the WNBA. Women are particularly verboten in the world of sumo; they are outright forbidden from even entering the dohyo, the ring where the wrestling takes place, because menstruation makes them symbolically unclean. This issue came to a particularly ugly head in 2000. Traditionally, the governor of Osaka awarded the Osaka Governor’s Prize to the winner of the city’s sumo tournament. However, that year the governor was a woman, Fusae Ota. Instead of standing in the dohyo and presenting the prize, she was coerced to stand ringside and allow a male representative to award the prize in her stead. Not so very long ago, female sumo wrestling was a popular attraction in Japan. However, this so-called onnazumo wasn’t a genuine sporting event but rather entertainment organized by brothels. Organizations of female sumo wrestlers still occasionally pop up, even as far away as the United States—as seen in the video above—but it is quite unlikely lady sumo will ever catch on in any major way.